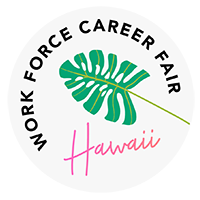 We invite you to attend Hawaii's largest career fair, the WorkForce Career Fair on Wednesday, January 30th from 10 a.m. to 3 p.m.
Over the past 21+ years, this one-day event has helped thousands of job seekers find fulfilling work and advance their careers. Pearl Harbor Naval Shipyard is hiring! They're looking to fill over 150 positions and a Direct Hiring Authority mandate allows applicants to skip the usual lengthy application process. Bring an updated copy of your resume and plan to come early!